10/04/18 TULLOCH CALEDONIAN STADIUM - INVERNESS Inverness' Joe Chalmers. Glasgow-born Chalmers began his career with boyhood favourites Celtic, spending 11 years at Parkhead before joining Motherwell upon his release in 2015. 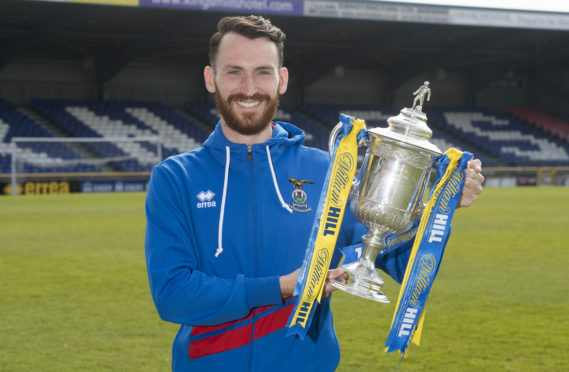 The 25-year-old is grateful for the miles covered by his parents to ensure he could attend training and matches as a youth player, and says they will be uppermost in his thoughts at today’s last four tie against Hearts. Chalmers said: “My family will be at Hampden to support me against Hearts and they are a massive part of why I am here today. “They always come and watch me and it is huge to have that support. “My parents both had jobs but they used to take me to Lennoxtown four times a week to make sure I got to training. “They used to run about daft taking me where I needed to go, as well as taking my two brothers to their football clubs. “They are always travelling up and down the country to support me and this is my way of thanking them for everything. “This is my first senior game at Hampden and I can’t wait. I played in a Youth Cup final for Celtic but this is a different kettle of fish as it is a massive game with a big crowd. Inverness have defeated Edinburgh City, East Kilbride, Ross County and Dundee United to reach the semi finals of the competition, with the Jambos the first top-flight test they have faced during the run. Chalmers says John Robertson’s men have grown in belief with every round that has passed, and he added: “When Edinburgh City scored their equaliser late on, had you said back then we would get to the semi finals people would have been surprised. “With every round that has gone by we have played some good football. The cup run has been good for our confidence and it has helped our league form as well.